Since building my business, I have truly learned how to be efficient and productive whilst maximizing my time. I know many of you have 10 times more on your plate with kids, a career, and trying to build a business all at the same time, and I’ve had many questions about how to handle time in the best way. It might be no surprise that I’m exploring this concept today from a mindset perspective, but practicing this process will give you so much more time in your day and help you crush your huge to-do list. Tune in to discover how you can maximize the 24 hours that we’re all given in a day! Practicing this has helped me get everything I prioritize done, and I’m sharing a strategic process where you can take some actions that are going to work in your advantage. Why how you maximize your time has to do with your mindset. The reality of feeling overwhelmed. How to shift out from a place of feeling like there’s not enough time. Why looking at your priorities can show you if you are in alignment. What has helped me maximize my time and be really efficient. Hey guys. So before we jump into today’s episode, I have to give you a little forewarning for the next four episodes. The sound quality isn’t going to be quite as up to par as it typically is and I wanted to take this time to actually use it as a teaching opportunity. So I was digging in, I was recording a bunch of podcasts, four at once. I knocked it out, I crush it, I send them off to my producer, and he shoots me an email about an hour later and says that my microphone wasn’t properly hooked up. So it didn’t record the typical way that I do it and therefore the sound really isn’t up to par. And I had a decision in that moment and he said you know, I would recommend you change it and I sat with this for about a day and really thought about it because at first I was so bummed and really didn’t want to take the time to rerecord them because they were so good, and just because it takes a good amount of time. And so I just sat with this and what I realized is this; we often don’t put our gifts out into the world because we are too afraid or we think it has to be perfect in order for it to make the impact that it is meant to make. We don’t put our offers out there, we don’t put our websites out there, we don’t put ourselves out there to fall in love because we’re a work in progress and we think that and I already did an episode on this about perfection. But we think that it has to be perfect and something that I have learned so deeply in this journey is that it’s not about it being perfect at all, and that the best thing that we can possibly do is take messy action and mess up and the best thing I can do as a leader, as being an example of what’s possible for all of you guys is to also take messy action, to also mess up sometimes and to show that to you. So I chose to not rerecord these because I know you guys will love the content no matter what and even if it’s not perfect, you’re still going to love it. And the other reason is because I asked myself this question and I’m actually going to talk about this in one of the episodes that isn’t up to the sound quality. But when I asked myself if I already knew the result I desired was happening, if I already knew millions of people were going to continue to be impacted by these podcasts, would it feel important to me to rerecord these? And the answer is no, absolutely not, because I know that the message is in the content and not in the perfection of it sounding a certain way. Now, I’m grateful that I have my producer. He’s amazing, he crushes it, he’s particular, which is why I love having him a part of my team, and I chose powerfully that this is how I wanted to do it. So I wanted to give you guys a quick little lesson before we jump into today’s episode because your people will love your stuff regardless, even if it’s a little bit messy, even if it’s not perfect. And I know you guys will love this content even if it doesn’t sound quite like even this recording sounds. So just be aware, the next four weeks it might sound a little clunky but the message and the content is so good and I’m just so grateful and honored to be here, to be an example of what’s possible for you guys and to know that my network and all of you care more about the content than you do about the sound. So I love you guys, I hope you have a beautiful day and I cannot wait to jump into today’s episode. Hello, how are you guys? I’m so excited to be here. I know you guys hear from me every week on the podcast app. Wednesdays my new episodes go live, but I actually last time I recorded episodes, I recorded like, six so I haven’t been in here recording a podcast in a while and I feel super inspired, super excited to talk with you guys, and I feel like a lot has changed over the past month and a half since I recorded podcast episodes last. So just to update you guys a little bit, Chris, my fiancé and I, we are moving across the country. We are picking up our lives and selling our house and we are moving to southern California and we cannot freaking wait. I am so excited. And it’s taken a lot of growth, a lot of discussion, a lot of opportunities for us to grow as a couple and individually and now that we have announced it and told everybody that we love and care about, we cannot wait. Now, I feel like this is such a perfect topic to talk about today going along with kind of our move to California, which is the idea of how to maximize your time, and let me explain what I mean. So I have a wedding planner but we’re planning our wedding, Chris is a very helpful fiancé, I’m very grateful for that. We are planning our wedding. We are moving across the country now; we are selling our house. I am building a million-dollar business, Chris is also building a huge business right now, so we have quite a few things on our plate, not to mention our wedding is actually in North Carolina. So that makes it a little bit more complicated since it’s a destination wedding and it’s not in California. But here is the thing; I have found that how you handle time and how you maximize your time all has to do with your mindset first and foremost. You guys know I am always going to start there because what I’ve realized is this; that when we have the thought there’s never enough time or I don’t have enough time, that then drives all of the actions that we take, the feelings that we have, how we approach things. 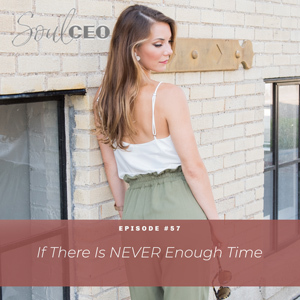 And so really think about when you are in the mindset of there isn’t enough time, there’s never enough time, and what everything after that looks like. Now, I know some of you guys listening have 10 times what I have on my plate. You have kids, you have careers, you’re building businesses maybe. You’re doing all the things and you guys are all high achievers and you want to be accomplished and have harmony in your life. And so many of you guys come to me and you’re like, “How do I find time to do all of these things that I ultimately want to do? How do I maximize my time?” So the first part of the process is to really look at the thought process that you have behind your time. And how I’ve actually seen this play out in my life because I have always had a super high sense of urgency, whenever Chris and I go home to visit my parents he’s like, “Now it makes so much sense,” because my parents are very busy bodies even though they’re retired and my whole life I played sports so I mean, I practiced five hours a day after school, I was always crunching in homework and like, all the things. So my whole mentality kind of my whole life has always been like go, go, go, go, there’s never enough time, we got to get it all done as fast as possible. And so something that I’ve noticed that even in my current life, yes we have a lot going on, but I have built my business and my life in a way where I have a lot of freedom and I have a lot of time and I will still catch my mind going there’s never enough time and I’m rushing around. And it’s pretty funny because then I’ll stop myself and I’m like, why am I rushing right now? But it’s kind of the speed that I operate at and it really is born from that mindset of there’s never enough time. I got to move faster, I got to get all the things done. Now, I’m not saying that doesn’t serve me in some capacity. I can crush a to-do list very quickly, but I also think it’s very important to look at when it’s playing in your advantage versus when it’s creating the feeling of overwhelm, which is where a lot of you guys come to me feeling, and feeling like you have so many things you want to do but then just being stuck doing nothing. So the reality is that feeling overwhelm, that creates the result of not getting anything done. I’m sure you guys have felt that before where you have 50 things in your list and you’re overwhelmed and you’re staring at it and then you spend the next two hours not really doing anything but feeling busy and feeling overwhelmed, and that really comes from the line of thinking that there isn’t enough time to get it all done. So I say all this to say how do we start to maximize your time? Again, we want to start with that thought process, so how can we shift out of that place of there’s not enough time? Now, a really good thought would be there’s plenty of time, but that might be a really hard thought to access when you’re very, very busy and you have so many things you want to do. Your brain’s going to be like, no way, I do not believe that. And remember, if you are shifting your thoughts, you have to shift to a thought that you can get on board with and you can believe. And how you know that is you’ll experience a feeling in your body. So what could you get on board with? A thought that I really like to access and hopefully it helps you is there’s plenty of time to get what’s most important done. Now, can you feel that? Do you believe that? Yeah, you might not be able to get all of the things done but the most important things, there is plenty of time to get that stuff done. And what that does for me immediately is I feel that in my chest. It creates a space where I’m like, okay this is good, there’s plenty of time to get the most important things done. So first you want to access a line of thinking that will fuel you forward, that will create efficiency and not create the feeling of overwhelm. Now, the next part of this is kind of a strategic piece. So you guys know I always start with mindset and then we can go into some actions and things that might really work for you. So what I have my clients do in my Mango Magic Business Academy and in now my Mango Magic Life School, which just recently launched and I’m so freaking pumped about it. But what I have them do is identify what do they want their priorities in their life to be. What do they want their top five priorities, and to actually write them out. Now, it would be a really powerful exercise to write out what your priorities actually are and looking like how they compare to what you want them to be versus what they are now. But we’re not going to fully dig into that today. What I want to look at is what do you want your priorities to truly be. Then, identify what tasks and what things fall under those priorities. I highly recommend seeing an opportunity for growth if you are not at the top of your priority list. Another little side note and challenge for you guys. But anyway, you get to decide what you are your top five priorities. And then identify what are the tasks, what are the things in your life that fall under these priorities. Because what I find so many high achieving and women like all of you guys do is we like to take on all the tasks and we like to make them our own and our responsibility and we say yes to doing things like making cupcakes for our kids first grade class when we really don’t want to. Or saying yes to doing something that doesn’t really line up with our priorities but we just feel like we should or whatever it is. But what is really powerful is when you start to look at these top five priorities and you start to make decisions on the tasks that you take on based on these priorities, you will also quickly realize which things are in alignment with that and which things you can leave for later or let fall to the bottom of your list. So again, what you guys can do, write your top five priorities and then identify what tasks you are committed to doing under these priorities in order. Then, go to the things that are on your list that aren’t on the priority list right now that need to fall by the wayside, that need to be outsourced, that need to be handed off to somebody else like your kid who can wash the dishes. I’m just kidding. I don’t believe that you have kids just to have little servants. But you know, whatever, I’m just joking. But does that look like letting your husband or significant other take on some of those responsibilities? Does that look like hiring someone to mow your lawn? What are the tasks that aren’t in alignment with your priorities? Then your work might be to get over any mind drama that shows up when you think about letting go of those things. So I want to tell you guys a really quick story. I will never forget when I was building my business, I was waking up at 4:30 in the morning, going to the gym, coming home, cooking, prepping my lunch, working a little on my business, going to my job, working all day, coming home, and I’m sure again, a lot of you guys have that schedule probably times 10. I come home, I made it my responsibility to cook the dinner, and then I would work on my business, go to bed and do it all over again. And then on the weekends I would work a lot on my business and I would clean the house and do all of these things. So what I started to realize was like, I was feeling resentful, I was feeling like I was doing all of these things and I felt like there was never enough time. All the things. So when I worked through this concept, I realized that I was taking responsibility for some things that didn’t line up with my priorities or weren’t that important. So I’m going to challenge your mind a little bit here. One of those things was cleaning my house. I love having a clean house guys, I really do. And I realized that at the time, I would only clean my house when I could and when I wanted to and I wouldn’t out of a place of I have to do this, this is a must do and the house got a little bit dirtier, but guess what, I was taking action and doing the things that were in alignment with my priorities and it felt really good. And I knew there would be plenty of days to clean the house later on, once I quit my job, once I built my business, once I did all these things. And so again, one of the biggest things you can do is really let go of those tasks that aren’t in alignment with your priorities. And if you can, outsource them because think about not only is that an investment in your time and giving you some time back, but that is an investment in your happiness and you feel good. And think about how much more productive and creative and excited you would be if you weren’t bogged down by these tasks, these extra tasks that you didn’t have to do that were aligned with your priorities. Now, here is the other thing that I do, just a little tip for maximizing my time. Every week, I will go in the notes section of my phone and if I have a giant list of things I want to do, what I’ll do is I’ll write Monday through Friday or whatever days I’m choosing to work. And then I will literally take the tasks from a place of there’s plenty of time to get all these things done and I will split them up. So I will only put a couple of tasks on each day and as you continue to do this, you start to learn how much you really can get done. Something I used to do is I’d put all of my tasks on one list and then I would be like, getting two things done and then I’d feel frustrated like I didn’t get anything done that day. But what I do now is I’ll just split them up and I’ve learned how much I really can get done in a day and if I finish it all and I have more time then I’ll take some from the other days. But that really allows me to know like okay, well Tuesday I already have allocated this task so I don’t have to think about that right now. I just have to focus on the tasks at hand. And that has really helped me be even more efficient and even more productive. So anyway, I know time is a really big thing for you guys as you go out there and you live your best life. I would love your feedback. I’d love for you to share this on your Instagram story. I seriously love it when you guys tag me. I try to interact with all of you. Again, my Instagram is @lindseymango_ and I cannot wait to hear about how you maximize your time in a really big and powerful way for the rest of the week. I love you guys; I hope you have a beautiful day. Bye.